Silence echoed in the glade. My moccasins crept along the ridge’s west slope, downhill enough to avoid detection from the east. The air smelled moist. A butterfly breeze jostled leaves, but not enough to raise even a telltale whisper. Dark shadows embraced the saplings in the River Raisin’s mucky bottomlands. Sunlight bathed the marsh grass and cattails that kissed the river’s bank. Now and again I caught a glimpse of the dark ribbon that flowed northeast. It was plenty early on that October morn in 1795, the new day dawned young, fresh and cool. High up in the forest’s canopy red and yellow and gold and burgundy leaves fluttered as if waving “goodbye.” Light green grass carpeted the ground awaiting fall’s calico blanket. My moccasins stalked slow, an indication of conscious stealth more than caution. My eyes scanned the limbs and branches for an industrious squirrel, but saw none. As I progressed, I took note that the hills and valleys were devoid of deer, either bedded or just passing through to the river bottom’s security. Scrapes and rubs proved non-existent, too, a foreboding sign that a long, meatless winter loomed. In time, my course came upon three downed red oaks, their tops tangled and intertwined for eternity. I sat upon a keg-sized branch and leaned back into the fork of two thick limbs. 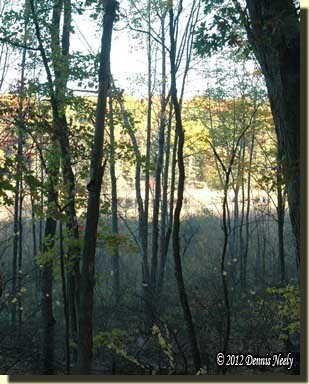 I gazed upon the little valley, watched the treetops and waited to hear or see a plump fox squirrel. I began to wonder if I had moved too fast or been too visible. I thought of John Tanner’s resolution to become more cautious, to move slower and work for the best possible shot. Without conscious thought I kept repeating “I now made a change in my manner.” This phrase is my reminder to exercise care and forethought in my passage through the glade. As I sat pondering my own woodland manner, I thought I detected a soft cluck: “Arrrkk.” The second cluck whisked away any doubt. My right hand left the Northwest gun’s wrist, inched upward over my chest, beside my neck and to my head. As I tugged the orange head scarf off, I wadded it in my palm in a desperate attempt to make the color vanish; slow and easy, I tucked it out of sight, inside my linen hunting shirt. In my estimation, a wild turkey is worth a dozen squirrels. The pages are coming loose in my copy of The Falcon, the narrative of John Tanner. At least two dozen sticky-note passage markers, in a myriad of colors that denote different times of study, protrude from the book’s edge; eight or nine stick up from the top. On the pages themselves the yellow highlighter has all but faded into oblivion; the red flair pen underlining is still clear, as are the notes scribbled in the margins, again displaying a variety of colors and penmanship. I cannot fathom how anyone can read a book without marking key passages in some way. The only book I do not treat this way is my Bible, but even there, I have an inexpensive, soft cover version with highlighting and sticky notes. The passage quoted sports a pale yellow sticky note, faded highlighting that has been refreshed at least once, red pen underlining and a prominent red star in the margin, all placed during my first reading of Tanner’s narrative. Over the years I’ve come to call this excerpt the “change in my manner” quote. I’ve shared it in a number of essays, blog posts, and on several occasions, built an entire teaching session around the traditional hunting wisdom hidden in Tanner’s words. But on that fine October morn the ‘change in my manner’ quote spurred my thoughts in a different direction, inspiring me to take action on an idea that has intrigued me for several years: the creation of a new persona influenced largely on Tanner’s narrative. As I reflected, I realized that I have refined and tweaked the same persona for three decades. In my early years on the traditional hunting trail, I followed the unwritten edict, at least for that era, that a persona must be a fictional character, rather than an emulation of a once-living hunter hero. I believe that philosophy was born out of limited documentation that all but required an amalgamation of first person source material to create a viable living history persona. But times have changed and so has common practice. As I sat with my back against the barkless oak limbs, I recalled the advice I gave several guests at the recent Woods-N-Water News Outdoor Weekend. One fellow’s question about how to begin creating a persona required a lengthy answer. The impromptu seminar grew, and soon a dozen people stood in a semi-circle around me. Everyone got into the conversation, and at one point I responded: “Build your persona around a geographical location, time period and station in life that interests you. This is supposed to be fun, so have fun with your persona.” I decided I needed to heed my own advice. The time never seemed right, and certainly, now is not a good time with all that is on my plate, and yet, now is as good a time as any. With some forethought and planning, yesterday I began re-reading and outlining John Tanner’s narrative. I have no idea how long this project will take, and it really doesn’t matter. I didn’t make it through the second page before I came to the conclusion that I cannot achieve the results I expect with sticky notes, highlighters and margin scribblings. I stopped and started over, entering key passages in a searchable database for future reference. On the one hand, the typing in of important quotations takes more time, and on the other, I find I tend to remember the specifics when I linger and study the sentences and the messages they contain. As it stands now, I do not wish to create an exacting first-person impression of The Falcon. My goal is to glean enough information about a favorite hunter hero to re-create a reasonable facsimile to experiment with in my wilderness classroom. By studying Tanner in-depth, I hope to gain a greater understanding of his life circumstance, the material culture that surrounded him and to gain a different perspective into the methodology employed by an 18th-century woodsman. My first session with John Tanner lasted a quick three hours. I made it through the introduction and the start of his abduction. In that brief encounter, I felt a renewed vigor wash over me. I felt compelled to read more, to learn more and above all, I experienced a haunting desire to lay down The Falcon’s narrative and rush through time’s portal, to journey back to the Old Northwest Territory. And yes, I had fun. So, start a living history project you’ve put off, be safe and may God bless you. 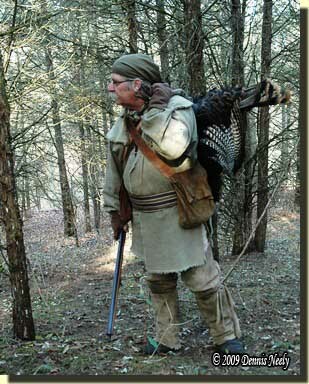 This entry was posted in Persona, Research, Squirrel Hunts and tagged Dennis Neely, historical trekking, North West trade gun, Northwest trade gun, traditional black powder, traditional black powder hunting, traditional blackpowder, traditional blackpowder hunting. Bookmark the permalink. I just discovered your blog by accident or should Isay serendipity.You are a light in the forest.God bess. Thank you, Joe, for the kind words. 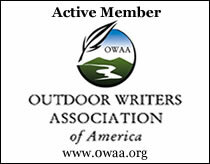 Please share this site with your friends and enjoy your visits to the 18th century and the Old Northwest Territory.